The method is simple. 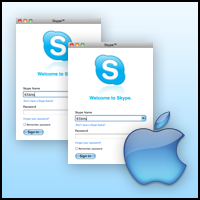 We need to create another user on your Mac and launch a new Skype application under the name of the other user. The downside is that this new assignment Skype is attached to this new user. You can not send files via Skype by drag & drop, because the second sale of Skype will not have access to the main user files - the first. 1. Create a new user on the Mac via the system preferences panel. For example, a user named SKYPE2. 5. Authenticate with your second login skype.